With performances, live music and art demonstrations throughout Breckenridge, town is one busy place during the Breckenridge International Festival of Arts. This festival is part of Breck Create’s efforts to highlight the arts district and culture in Breckenridge. Each day has a schedule of different events and times so it is important to check details however it is a great festival that is jammed packed so make sure to catch your favorites! 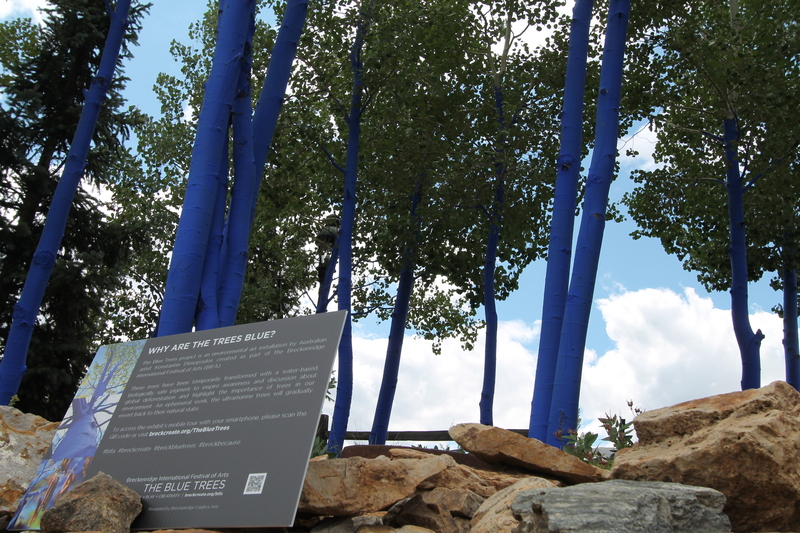 The Blue trees can be seen all weekend long on Main Street in Breckenridge. The idea of this art symbolizes the importance of environmental awareness by artist Konstantin Dimopoulos. As you walk around the town make sure to stop and take a look at the trees that represent our beautiful town. This exhibit held at the Old Masonic Hall from 11am – 6pm. This exhibit features one of a kind bicycle art posters by local Colorado artists. Stop by the exhibit as you walk down main street Breckenridge stop by the Masonic Hall and see these art posters that are hanging throughout the building. This event is a great one to see! Walk by Festival Square in Breckenridge and see bicycles dressed as monarch butterflies. These creative works of art have butterfly wings that span over 12 feet high and intricate art work on the body of the bike/butterfly. This unique exhibit is also pay contribute to the USA Pro Cycle Challenge coming to Breckenridge this Thursday Aug. 20th and Friday Aug 21st. Walk a local Breckenridge trail and enjoy like performances and sculptures as you hike. This unique event offers a new way to enjoy hiking and the beautiful scenery of the Rocky Mountains. Talk to the artists and discover the inspiration behind each of their art pieces and performances! This event hosted at the Riverwalk Center features radio host Ira Glass. This well-known radio host of This American Life on NPR will hold a comic-storytelling evening filled with his experiences in the radio field. Tickets range from $45-$70 and can be purchased at the Riverwalk Center or online. Artist Julie Hughes conducts arts made from cast paper tree skins at the Old Masonic Hall. This art demonstration is in efforts to share a different side of nature in which our relationship with can seem somewhat frail. Come see these pieces and experience nature in a way never thought before. This exciting event is a combination of silent-movie/ live music. Composer Benoit Charest, plays his exciting 1920’s Paris and LE Jazz Hot to the tune of the Oscar nominated film the Triplets of Belleville. This fun filled event is great for the kids! Tickets start at $24-$45 and can be purchased at the Riverwalk Center or online here. The River walk Center hosts a late night closing party at the Riverwalk center. Enjoy the events as it comes to an end in Breckenridge! Live music will be held throughout the evening starting around 6pm. These concerts will be held at Festival Square, on the corner of Washington and Ridge Street- one block up from Main Street. Other performances and live music will be held at the Riverwalk Center where you can purchase tickets or online here! The Breckenridge International Arts Festival is jam packed with many different events, performances and live music. Come to Breckenridge this weekend and experience the mountains in a new light that combines art with nature. Below is great deals for lodging in the area. For more information and scheduled times of each event, Click here! The weekend is closely approaching! With exciting jam packed activities and events going on like the USA Pro cycle Challenge & the Breckenridge International Festival of Arts, it will be a fun filled weekend to be in Breckenridge! It’s a fun filled weekend in Breckenridge so make sure to not miss out on any of the fun performances, events and live music! For specific times, information, and to buy tickets click here! The 2015 USA Pro Challenge starts Monday and will be in Breckenridge for the Stage 4 finish on Thursday, August 20th and all day Friday the 21st for the Stage 5 individual time trial. This year is the first time that Breckenridge will have a time trial so instead of just a start or finish which just has the riders coming in our leaving there will be a series of individual races against the clock all day. Click here to see the route for the entire race. The USA Pro Challenge is Colorado’s annual multi day “stage” race that brings the top road bicycling athletes to compete for top honors in a grueling 7 stage course that traverses the highest (and toughest) mountain passes in the country multiple times. The USA Pro Cycling Challenge is one of only three top rated races in the United States and is widely considered one of most important pro cycling races in the U.S. 2015 is the fifth year the race has returned to Colorado and has quickly become one of the most popular summer events across Colorado, drawing spectators from all over the world. This year for the first time there will also be a women’s Pro Cycle Challenge. This will be a 3 stage race and will begin in Breckenridge with a time trial (just like the men) and then continue from Loveland to Fort Collins. The final stage will be a tough circuit race in Golden. Thursday August 20th, Stage 4 will start in Aspen coming over Independence pass and Hoosier pass into Breckenridge. Breckenridge will be showing the race all day on jumbo screens in the Blue River Plaza and many other events will be happening including the very popular kid’s Strider Challenge where 2 to 5 year olds will be racing their Strider bikes down Main Street to the real finish line. Other events include scavenger hunts, a stunt show. Parade, concerts and more. To see a full line up of Thursday’s events click here. Friday August 21st, the Stage 5 Time Trial will be happening all day and for the first time the inaugural Women’s Pro Cycle Challenge kicks off with a time trial event. Time trial racing will start at 10 a.m. and go all day with the women sharing the same course as the men. The 8.5 mile time trial starts out flat then climbs up Moonstone road. Finally racers will push the limits on the Boreas Pass descent. For a complete rundown of Stage 5 click here. Make plans to come to Breckenridge next week to witness one of the premier professional bicycling races on the country. 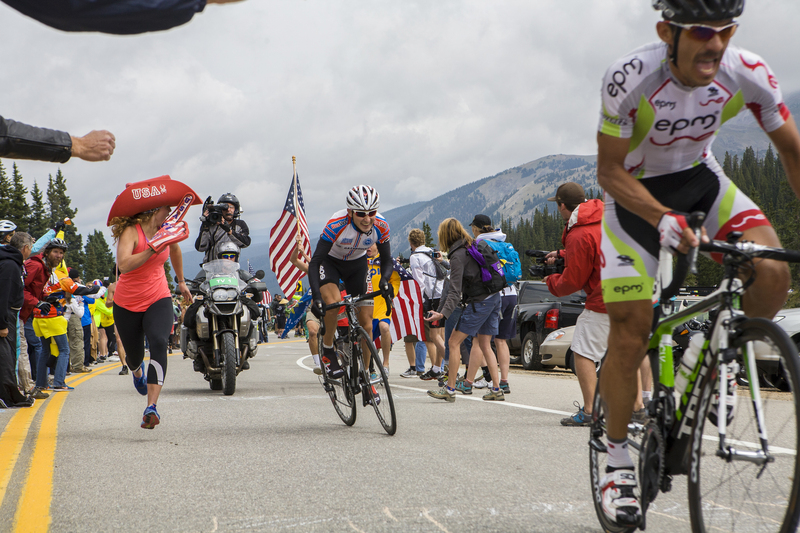 Breckenridge is excited to once again welcome the Pro Cycle Challenge back! One important thing to remember is on Thursday and also Friday there will be significant road closures to accommodate the race. Click here for a complete list of road closures next week. If you are looking for the best lodging deals for Breckenridge lodging and the USA Pro Cycle Challenge visit our partner site www.breckenridgediscountlodging.com. The Breckenridge International Festival of Arts starts tomorrow! Check out this line up of all the events, performances and activities going on throughout the weekend! Ready Paint Fire is a one of a kind activity in Breckenridge. With really nothing else like it, Ready Paint Fire offers a bulk of arts and crafts such as Pottery, Canvas, Mosaics and Glass Fusing for all ages and skill levels. Open year round, check out Ready Paint Fire for a change of pace during the winter or summer! 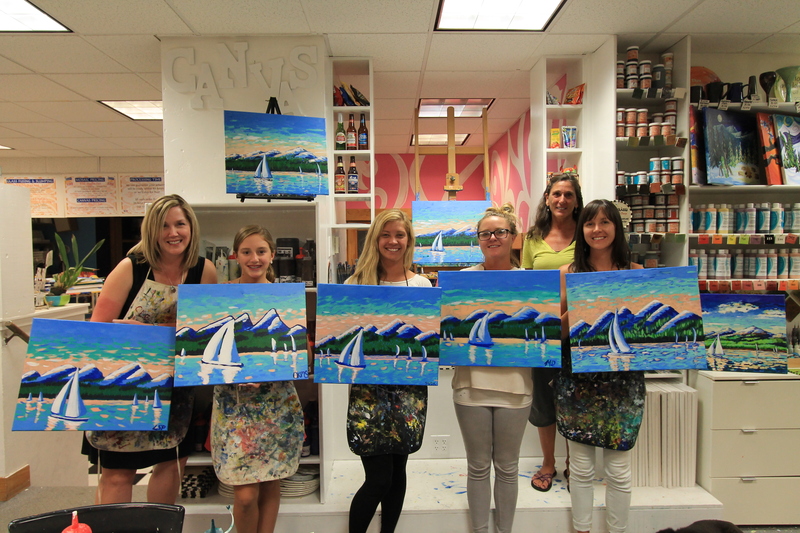 Firsthand experience: A couple of girlfriends and I signed up for a Canvas Painting Party to try something different and see what this establishment was all about. Beth, the owner, greeted us with a very friendly welcoming and was available throughout the duration of the event to offer a helping hand. Nancy was our teacher and the picture of the evening was sailboats on Lake Dillon in the evening. She was very informative and worked very well with each individual so we were able to follow her step by step to creating our very own masterpieces! You are equipped with everything you need including the canvas, brushes, smock, paint and palette. These classes run from 7-10 and typically don’t start until around 7:15-7:30. It does take the full duration of time to finish your painting so plan on eating dinner beforehand! They do have drinks available for purchase including wine, beer, champagne, soda and juice so grab your girlfriends and sign up for a private party or bring the family for a fun night out. You can reserve online and pay in advance or just call during operating hours and make a reservation over the phone. Some of the popular paintings sell out very fast so if you see a picture on their Events Calendar you like it is recommended to sign up in advance. While their canvas parties seem to be a big hit you could most certainly go a different route and choose what you fancy. Their pottery includes a wide selection for you to choose from: mugs, bowls, plates, platters, pet bowls, cookie jars, banks, figurines, picture frames, beer steins, martini and wine glasses, dishes and kitchenware. Here around the holidays? Fun seasonal items become available! Mosaics, stained glass and fusing are also always available! For the BEST lodging deals in Breckenridge, visit BreckenridgeDiscountLodging.com or click the banner below to view our current special! If you’re coming to Summit County this weekend, make sure to check through this list of events going on and don’t miss out on all the fun happenings! To learn more about any of these events and find out the full schedules click here!